With a safe home to call their own, a poor family gains a solid foundation for building a brighter future. 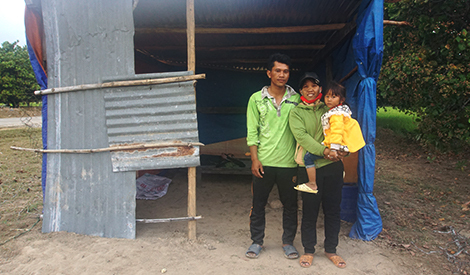 It takes only a few thousand dollars for Cross International to build a simple, sturdy home for a poor family, dramatically improving their standard of living. These donor-sponsored houses replace rickety shanties, patched together from scraps of metal, tarp and cardboard. In many cases, the beneficiaries contribute “sweat equity” to the project. This labor creates a sense of ownership over — and responsibility for — the new homes. The houses our ministry partners build are a permanent testimony to God’s provision and the Christ-like compassion of our benefactors. In 2018, we helped four Christian ministries in three countries provide safe shelter for the needy. Those efforts included, for example, Cross’ work with an evangelical church in Vietnam and Rainbow Network in Nicaragua. In Vietnam, the poor often live in houses made from materials they glean from the land, including thatched roofs made from palm fronds or woven bamboo. Some of these homes are falling apart and are in too much disrepair to be fixed. To meet this need, Cross International partnered with an evangelical church in Vietnam to bring safe housing to families living in destitution. Our ministry partner is intentional about meeting the needs of the poor and sharing the hope of the Gospel in both word and deed! 15 sturdy houses were constructed with Cross International funds. 88 poor adults and children now have a safe place to live! Half of the recipients were needy church members, and the other half were be non-Christians in need of a home. This is done to minister to those within church walls, and to reach out to those outside of it. Funds provided to this project in 2018: $15,000.